I developed a dislike for rhubarb from very early on, so finding the most palatable incarnation of rhubarb has been not dissimilar to walking a mine field. I could never find anything appealing about the stringy texture or tart sour flavour. To be honest I still struggle, eventhough I’ve tried to enjoy it, now older and wiser, in a few different forms recently. But, I think I have found a very good way to enjoy this hideous vegetable (yes, it is one). This delectable unassuming loaf is it. Accompanied by fresh strawberries, this bread is all things wonderful. It’s made with a wholemeal flour blend, it is low in sugar, I’ve adapted the original recipe to be dairy free and it’s a one bowl mix. I was actually so amazed at the flavour I ate 2 slices before the bread had time to cool down. It was wonderfully moist and not at all tasting of what I recalled of rhubarb. Quick enough to rustle up before heading off to work in the morning too. The recipe was adapted from Maria’s FoodNouveau – Just Recipes. I have used slightly less fruit (2 cups in total) and have substituted peanut oil for melted butter. You could use vegetable oil if you are catering for a larger group where a peanut allergy may be an issue. Preheat oven to 180C (165C fan forced, 375F, gas mark 4). Line a loaf tin with some nonstick baking paper. To make the loaf: in a large bowl, beat the eggs with honey and sugar. Add flours, baking powder, mix together, then add melted butter. Mix well. Add diced rhubarb and strawberries and fold using a spatula until the fruits are well integrated. Pour batter into the loaf tin. Bake in a preheated oven for 45 minutes in total, rotating the bread after 30 minutes. Test with a wooden skewer – if the skewer comes out clean, remove from oven. If the skewer has residue of uncooked mix, cover loaf tin with aluminium foil and bake for a further 10 minutes. To serve: allow loaf to cool completely before slicing. Serve plain of toasted lightly with a drizzle of maple syrup, a dollop of clotted cream, or both! Great rendition of this colorful and tasty bread! I love that you made it dairy-free, especially because I’m lactose intolerant myself. I usually make it with goat milk butter, but if you want to go 100 % dairy free, vegetable oil is the perfect alternative. I’m happy you liked the recipe and passed it on! Oh, thanks for stopping by Marie! I often cook for big groups and when I saw that your recipe had melted butter in it I thought it would be perfect for a dairy free option. And I loved the rhubarb in it too – thank you for inspiring me to try it! This looks like the perfect thing to take to work for afternoon tea, going to bookmark it for future reference. I love rhubarb. As I kid we’d tear off stalks and dip the ends in sugar and sit under a tree and eat them. I don’t do that any more but I still love it. Beautiful photos, truly stunning, and the recipe looks beyonndddd delicious! 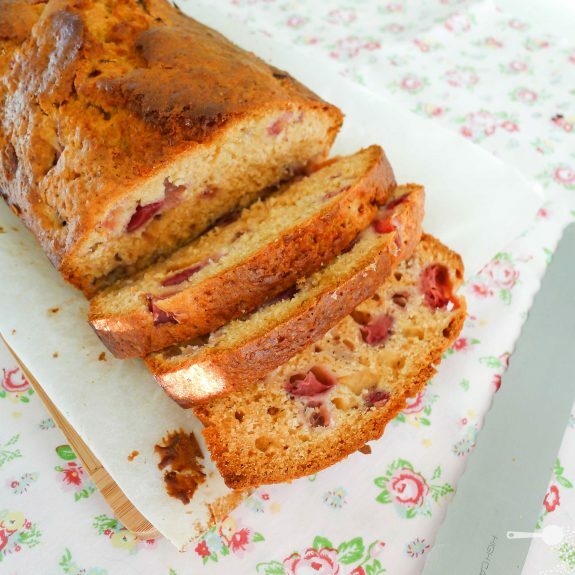 I baked my first rhubarb treat earlier this year and this looks like a lovely next rhubarb based adventure! This loaf just looks so good, this is what spring baking is all about. Thanks for the recipe to try.